Twitter was back online at this point. Let see if it helps my accuracy. Yep, it already did. 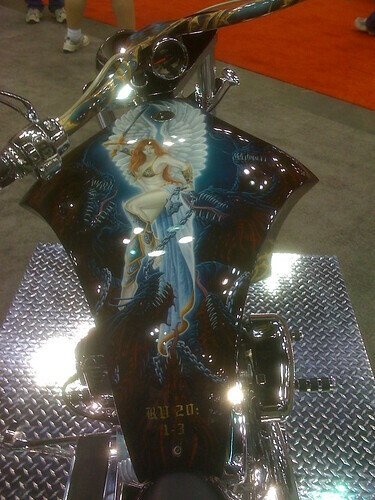 I forgot to mention the killer bike we saw in the art area of the Dealers room. If I was going to ride a bike, this would be the one. Which is another way of saying there is no way in hell I will ever ride. Actually, the whole thing is done very well. Lots of time and attention is put into creating an engaging environment and the reward tokens are a brilliant idea (not to mention XP, I’m a level two adventurer now, huzzah). The adventure we were on was called the mini-quest which introduced both the game systems and this year’s story (a great red dragon named Smoke has come to town and we all have to marshal forces to fight it). We were given a pretty cool quest to liberate a medallion from a temple of Pelor. Apparently the arch priest is pretty miserly. Or you know… we’re just a bunch of rogues. The tests were combinations of puzzles, physical obstacles courses and combat (done a la shuffleboard with hit locations on the board). Although we didn’t do great, everyone survived the entire quest, albeit in some cases only barely (I think I had 2 hit points left). The rewards mechanic is well thought out. Give people lots of rewards, only some of which are that useful. Also grant people levels even though the levels don’t seem to do much. It’s definitely the kind of rat going for cheese Pavlovian trick that will keep gamers coming back for more. The physical obstacles were cool. One involved sneaking past a guard by going very slowly. Another was throwing a grappling hook. A third was tiptoeing around trip wires to avoid setting off an alarm. My only concern here would be that you had to be pretty thin to fit through the last one and many gamers wear a 5 belt of impressive girth. Overall I like the difficulty of the physical challenges. The puzzles were hard but fair. We failed the first one (2 of 3 locks unpicked) but figured out the rest. It was, sadly not a very good warm up for the difficulty of the puzzles in the next adventure (5 aspects) but I’ll get to that in another post. The last challenge was a puzzle that we felt like hot shot for figuring out. The GMs in each room were pretty cool. They gave us small boons (read loot) for being the first in a room, or for asking the right question, etc. They also played up the horrors and the dangers of the dungeon as well. We totally jacked the priests of Pelor and made it into the thieves guild for our efforts. We lacked class (yeah, make all the jokes you want, we did) so we didn’t get to experiment with any class powers. Also regardless of weapon we brought into the dungeon we all had obsidian daggers that did 1 point of damage. I get it, it was a demo, but it did make us feel pretty generic. We had a guy that had run True Dungeon a bunch of times and while I liked having a little advice about how to play he kept rushing through stuff and taking over without giving other people the opportunity to figure it out. He was a nice guy, just very pushy. I’m not sure what the GMs can do about that except to try and present challenges to the newer players. Ultimately is about group dynamic and like all games I recommend (if you can) that you play it with friends. There is no role-playing to speak of. This is definitely not a LARP and most of the time the closest we got to “in character” were Monty python-esque jokes. Over all, you do it for the game and the immersive environment, not the feedback. Story Cards Custom Adventure: Reuniting the Tribes. This game was bitter sweet for me. For some reason I looked at it and thought it would instantly produce awesome, which really isn’t a fair expectation. I loved the idea behind the game system, I loved the concept we made. I loved the character interactions. I just felt the actual “game” as presented was three combat encounters. We had great players which made a great story, I just wanted the “story card” mechanics to drive things more (or at least more visibly). As I said in the previous post we had zombies on the brain. The setting we pitched to the GM was a post-apocalyptic earth taken over by zombies. The resistance was at least a hundred years old, old enough to establish pocket communities underground in Zion Las Vegas. The tribes were united by the hotel they were under. My character for example, Trout Bellagio, came from an underwater base beneath his namesake. Character creation was the most novel and interesting aspect of the game. We laid cards out in a tarot like formation. Here’s a picture form the website that does the pyramid but leaves off the top card and is upside down. The characters past, present, future, gift, bane and destiny are drawn from these cards. If you draw the card upside down the idea is to use the inverted meaning (Strength = Weakness for example) but you can go off of any idea on the card (either the general or specific titles, the picture or any of the symbols). The idea is the card should inspire you in some way that you carry forward. I had a school of fish for my past, a sword for my present and a leader for my future. To me this was the story of a nobody kid who came to distinguish himself fighting the enemy and eventually lead the tribes. The other characters were actually quite a bit more interesting. In fact the story really got turned on its head when one of the characters was a prisoner and the enemy. We invented the idea that Zombies (which we had named “greys”) were creating a new breed that looked identical to humans. Suddenly we were playing BSG with zombies instead of Cylons. The game was awesome and ended in one human betraying the entire Luxor tribe and my character falling in love with the zombie Grey. The tribes, as it were, were united. For all of about 10 seconds when the building we were in blew to hell. We crafted this Matrix/BSG/Zombie story that was beautiful in its simplicity and elegance. Everything in the end made so much sense. The love story, the betrayal and of course the fact that nobody would ever know it happened. It was an emotional tragedy stacked on top of the horror genre. The cards helped in this somewhat (when Zach realized his character was probably a “grey”), but most of it came from our inspiration the previous night inside the abandoned mall with zombie janitor. Character creation (as mentioned above) really benefitted from the cards. We created rich dynamic characters very quickly. The games resolution system was acceptable though not great. Creating skills was fun. I used my “remove the head” skill quite a bit, which made me happy. Especially because my “sword” was a busted off slicer from an old paper cutter, with the brand “Singer” barely still visible on it. Singer became the signature weapon of the game. Each scene we got to draw a card to hold in our hand. Playing the card could either aid a skill check (if it had the appropriate symbol) or could introduce a plot or setting element into the fiction based on the inspiration from the card. I like this but like other elements our ability to use it and exercise narrative control was limited to what the GM found acceptable. I would like to see this fleshed out more and create a currency where these cards were earned and used more frequently. Our GM Scott came up with an adventure totally on the fly with the use of the cards and the pitch we game him. The adventure didn’t float my boat (see below) but I still have to give him credit for putting it all together in the 20 minutes while we made characters. I think this would have improved if it was a more interactive process. As I understood it (we didn’t stay after to talk to him about it) the GM took the basic pitch from the group about what kind of game to make and then use the cards to craft it. The game as I could tell was a somewhat freeform story with three choke points where we had to fight zombies. While appropriate to the setting these combat encounters added little to the story. The system while fine in its mechanics (essentially drawing cards and looking for matching symbols) seemed arbitrary in its resolution. We drew cards and got, for example two successes. Is that good? Is it bad? More importantly, is it good enough? It seemed like the GM just used fiat to determine when we had overcome a conflict, which was disappointing. Here’s the real heartbreaker. As far as I could tell the cards stopped guiding the story after character creation was done. Every once in a while the GM would look a bit puzzled, pick up a card and read it (ostensibly for inspiration) but we never knew what was on the cards or what he drew from it. I wanted an open story where we looked at cards and threw out ides of what they inspired. We got something like that because Zach, Justin and I bulldozed our way into it, not because the system facilitated it. Still with all my critiques, I just bought two copies of the game. One for me and one for a GM who is still a little green that I hope will help when it gets in a “what the hell do I do now” moment. I think this game has a ton of potential but as it’s own system and as a supplement for other games. Next up… Ribbon Drive. The end of our innocence. I bought a copy of Story Cards too. I think I liked the Story Cards system more than you guys did. I agree its not a good system for expended combats but maybe something like a SOTC success ladder could be used to put more structure around that. Infact…I’m gonna go ahead and say that’s a brilliant idea! Maybe one you should talk about on a podcast.